The new third-generation Porsche Cayenne range with three models gets greater power, quicker times, and enhanced standard features for 2019 – and the 550-hp Cayenne Turbo SUV still thinks it’s a sports sedan. Crete, Greece — Is this really our exit? We’re leaving our lunch of octopus and fish behind as we set out for the afternoon drive when the navigation system on the 2019 Porsche Cayenne is telling us to turn down this nondescript, narrow gravel road with reddish, craggy rocks. When we pass the turnoff, the nav system immediately recalculates and gets us to turn around. So glad we did. The road is barely more than a car width wide, with no railing and a steep and most likely fatal drop to the Aegean Sea below. The scenery is breathtaking, like a watercolour painting where the lines between the sea, the sky and the isthmus across the bay are blurred in shades of blue. It’s expensive, but on the other hand, you can see and, more importantly, feel where the money went. The new Cayenne, in any variation, is a technological tour de force. This may well be the first automotive launch event on Crete, and based on the food, the friendliness, scenery and roads, may well not be the last. I had experienced the third generation of Cayenne a few weeks prior in Germany, but only as a passenger. With the wheel in my hands, it’s even more impressive. It eats corners for lunch and comes back for more. With the optional electro-mechanical roll stabilization system, it feels as though there is zero body roll. At one point, a corner tightened up on me unexpectedly, but we were already turning, so braking wasn’t an option. Instead, I just turned the wheel more. The nose dove a bit as the added steering took hold, but the car simply turned. No muss, no fuss, no squeal and no sliding. The power from the Turbo model is breathtaking: its 550 horsepower and 567 pound-feet of torque take the car from zero to 100 km/h in 4.1 seconds (3.9 if you get the sport chrono package). Part of that is thanks to the four-wheel steering system, which at certain speeds steers in the same direction as the front wheels to aid in lane changes, while at other speeds — such as the switchbacks on our route — the wheels steer counter to the front wheels. Carves corners and assists with parking. The effect is a car that feels smaller than it is. The roll stabilization feature, and other features, are made possible with a 48-volt electrical system that packs enough punch to drive the roll-stabilizing motors as well as the optional three-chamber air suspension. The Cayenne comes with three engines — a 3.0-litre single-turbo V-6, a 2.9-litre twin-turbo V-6 and a 4.0-litre twin-turbo V-8. Based on the engines, the SUV is called Cayenne, Cayenne S and Cayenne Turbo respectively. Think of it as fast, faster and OMG! 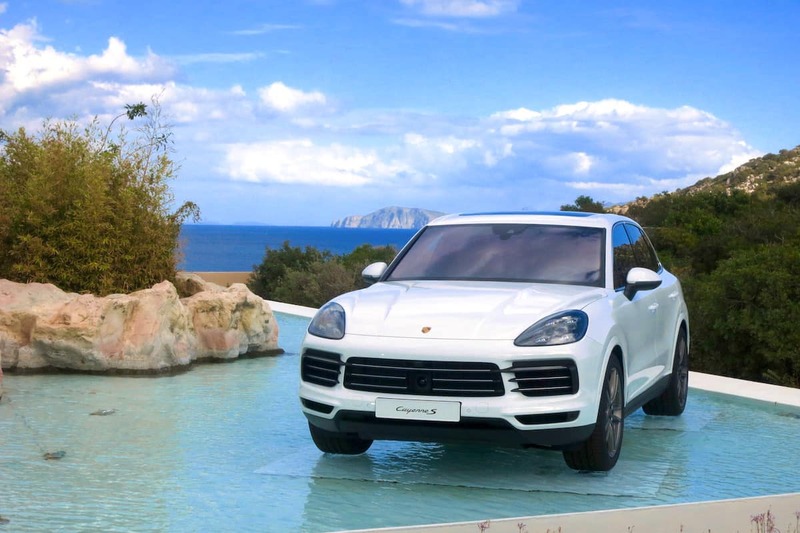 Porsche has always said its goal is to create the sports car of SUVs, and our drive on this island shows this is the closest yet. Put your foot in it and you’d be forgiven for thinking you were in a 911 Turbo instead. The handling of the Cayenne, even in a base model without the electro-mechanical roll stabilization, is particularly impressive given the vehicle’s weight. While they’ve shed kilograms off all models, this still isn’t a lightweight, ringing in at 1,985 kilograms (Cayenne), 2,020 kg (S) and 2,175 kg (Turbo). Porsche has also added 100 litres to the cargo space, and a variety of options — from racks to towing packages — are available to add to the utility. The interior is stunning. A sleek 12.3-inch display provides a window to all the vehicle’s functions, and it senses your hand coming in for a poke and brings up the menu relevant to whatever function (audio, navigation, etc.) that is up. In the centre console is Porsche’s new touch-sensitive control panel, which fades to black when power is off. These controls are actually quite handy despite being touch controls. Instead of just touching, you have to confirm your selection by pushing. Helps avoid inadvertent activations of unwanted functions, a common problem with many touch controls. The Cayenne will start at US$67,500 / C$75,500, the Cayenne S at US$82,900 / C$92,600 and the Cayenne Turbo at US$124,600 / C$139,700. Prices do not include destination, as today’s US$1,050 / C$1,250 destination charge may change by launch date. Dealers will begin receiving new Cayennes this Fall 2018. For more specs, pricing options, trims visit the new Cayenne site. This Nissan S14 has a serious GT-R Complex. And an RB26 Swap. We see a lot of 1995 Nissan 240SX done up, but not like this.